While I was having fun in the sun on the first ever Sisters’ Vacation, Mr. H.C. was hard at work. When I asked him over the phone what he was doing, he said, “Oh, working…” So I let it alone, and wondered what project he was doing… He had permission to organize his shop, lay in the hammock under the trees, and take naps. He admitted to laying in the hammock for fifteen minutes one evening (see post 18. Gifts of Time.) but he declined to take any naps. This is the almost-finished project that greeted me on Saturday evening. On Monday, I added the doors to the cupboards — it took me hours to find the hinges, spray paint the hinges, find screws that would fit, and put the closers on the doors. I wouldn’t do well being paid for my labor, but the end result was pleasing. The butcher block top is not yet bolted down; we are still trying to decide which side will get the overhang — the kitchen or the dining room. I was thinking of voting for a symmetrical look of even on both sides. See how the edges of the island are gently curved on one side? Do any of you out there in reader-land have an opinion on this? The kitchen and the back porch are open for visitors! We have a balanced top island and when we remodel our kitchen, I will make it into a bar, with a definite overhang on one side. Now all we can do is belly up. I would like a place to park my homeworkers while I make dinner…I love the rounded edges. I am six feet tall and have perpetual hip bruises from pointy corners. Yes, I think you are right about the overhang — the symmetrical me just loves balance. We have two stools and we’ve been moving them to different sides when we eat. I think we won’t make a decision until we get the big cupboard in next to it and see. I’m a visual learner. I’m sure you’ve probably completed this already so I’ll have to snoop to see what transpired. 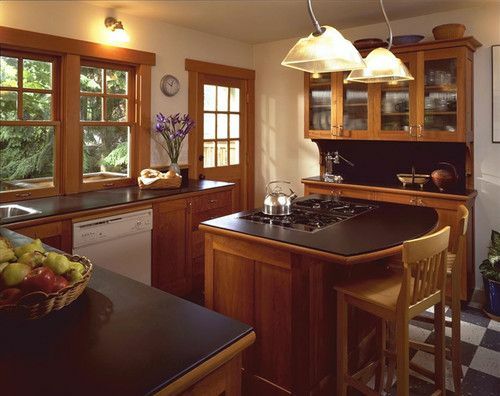 I probably would have gone for rounded corners in your cottage kitchen since it’s a softer look. The square, balanced look might be more contemporary for me, but I like that too in a different styled kitchen. Interesting. We haven’t done anything yet, (things move slowly here sometimes…) because no one wants to cut the corners (had to put that in!) and then be unhappy with it. And my hubby the carpenter, who will usually tackle anything, isn’t sure about it — or likes it like it is (more likely.) If he refuses to do it, I’m stuck with the square corners.